Japan is perhaps the safest place on earth, with perhaps the lowest death rate of any country on the planet when standardized for age of population. 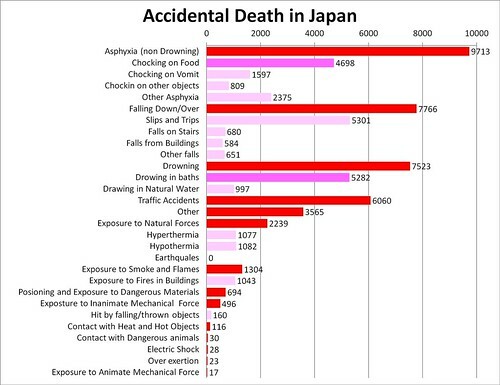 The above bar chart shows the low levels of accidental death in Japan. Pink bars are show sub-category composition data of the red bars above them. There are however two areas in which Japan is less safe than international averages (shown in darker pink) one of which is especially pertinent at this time of year. There are higher rates of chocking on foods, and higher rates of drowning in baths in Japan that in other countries. The elevated age of the Japanese population is one reason for these increased accident levels. Old people are more likely to choke on their food and to slip or otherwise fall below the waterline of their baths and be unable to get out. Another reasons pertains to Japanese culture in each of these areas. Japanese baths have deeper traditionally cubic tubs which allow shared bathing (particularly mothers and children) and foetal positions for that pre-sleep return to the womb feeling. In respect of choking, the Japanese enjoy a number of high-density, gelatinous foods such as konyaku, octopus and, the biggest killer, rice cakes (mochi) which are consumed especially at the beginning and end of the year. These high density foods enable the Japanese to enjoy a food rush without consuming the sort of quantity and weight consumed elsewhere of Christmas cake for instance. The fatalities to asphyxia as a result of rice cake eating are likely therefore to be far less than the fatalities due to obesity due to Christmas cake eating. Even so one should take care when eating rice cakes and perhaps gem up on ways to treat chocking in oneself and others (see below). The above chart is based on my translation of Japanese government statistics available from Statistics Japan Table 5-31. Other statistics of note to a Briton like myself, are that traffic accidents are so rare due to the great care that Japanese take on the roads one is almost as likely to choke on your food or drown in your bath than die on Japanese roads. Another fact that may take some visitors by surprise -- take care, drink water -- as many die from the heat of the Japanese summer (hyperthermia) as die from the cold (hypothermia). Animals cause 17 deaths per year due to brute force (including wild boar) whereas another 30 lives are claimed by dangerous animals (my mistranslation) including giant "sparrow hornets," the creatures that causes the most accidental death in Japan. From the sparrow hornets' point of view the death they cause is far from accidental. They are territorial and attack those that approach their nests and sources of food.